Hello readers! I hope you all enjoyed justified explosives day! I’m a little busy with grown up stuff so this’ll have to be short. 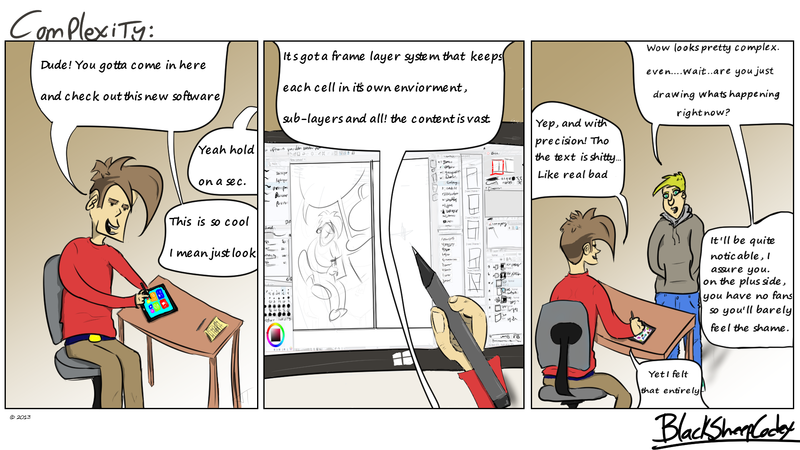 This whole little picture is about my adventure into the new illustration software I bought(read:stole). Thing is friggin awesome, it’s specifically designed for making comics so I have all kinds of tools at my finger tips that are a boon to the web comic author! Like selecting thru layers (so I can keep my sketch, inking, coloring, and shading all separate while using the borders to increase fill speed) and frame segregation (keeps my cells individual from each other…which in turn eliminates the clean up time for “over spray”). There is even a word balloon tool to help layout and merge all necessary dialogue vessels. In short there is a plethora of useful tools for the illustrator to use, and I am quite pleased to be (slowly) learning to use it, as I suspect it may make my turnaround slightly faster….something much needed as this time of year is very busy for me. There is however one very ugly duckling in this set of spectacular provisions, and that is the Text applicant that fills the balloons….it is god awful. First off you would think they would’ve made it so that there is a way to confine the text within the boundaries of the balloon, but they did’t and I guess I can sorta see how that might impede those looking to label outside the gabby little bubbles so I’ll let that fly. But the size of the text is far too large….even at its smallest it is just barely what I’m looking for, and even with that it screws up the spacing between letters and subsequent lines….It looks like a child typed in MSpaint. What you see up there is after I tried to fix it….and it’s still uglier than a stillborn. This is something that vastly disappoints, because it added back all the time I saved elsewhere, and It contrasts the rest of the program to extremes. I guess I’ll be on the hunt for a software to add my dialogue…until then just keep a plush toy by the computer so that your inevitable outburst of rage will find a more suitable target than your monitor. 05 Jul	This entry was written by CatastroFUCK and published on July 5, 2013 at 9:19 PM. It’s filed under artsy, Digital Wonderland and tagged DRAW ON ME!, happy ending, jerk breath, Paint (software), Speech balloon, Webcomic. Bookmark the permalink. Follow any comments here with the RSS feed for this post.